Q: After making corrections in a raw format how do I transfer it to JPEG and save my corrections? I'm using Elements 6 and I have a MAC. I try to move the pictures to iphoto and I loose all the changes. A: Let's just go through the basic steps and see if it solves your problem. After making your adjustments in the RAW Converter click the Open Image button. 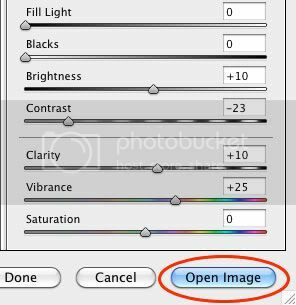 Your image should open as usual in Photoshop Elements with the changes you made in the RAW Converter applied to it. Now go up to the File menu and choose Save As…. In the Dialog box that opens make sure the Format field is set to JPEG. Click the save button and you should now have a JPG that reflects the changes you made in RAW and which can be brought into iPhoto. Try using the steps above and see if that gives you the results you want. If you need further help don't hesitate to ask. Just use the "add your own comments" link below. Q: I too have a Mac and PE 6 . trying to save the altered RAW file I used "save as" and JPEG was not an option . 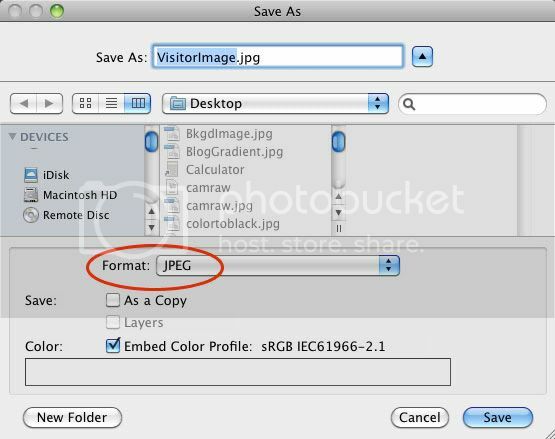 Only JPEG 2000 was offered in the JPEG format and it was not recognized by iPhoto. why am I not offered a regular JPEG format to save to? A: The most likely reason you're not seeing the regular JPEG as an option has to do with a setting back in the RAW Converter. At the very bottom of the Converter window is a field called Depth. This must be set at 8 Bits/Channel. If it's at 16 Bits/Channel you will not have as many File Formats to choose from when you save it from Elements. Awesome! Thanks so much! changing it to 8 bits fixed it!